I accept all of the above terms by clicking here or by any further use of this service. I do not accept any or all of the above terms. 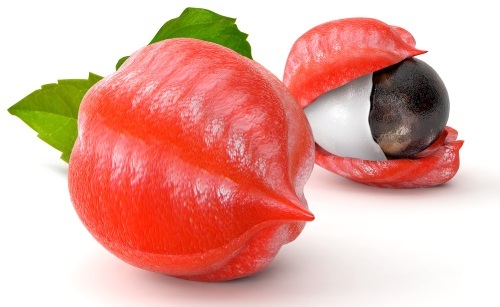 Paullinia cupana fruit and seed startling feature, resembling human eyes, gave rise to several myths and legends of its origins. This shrub of the Sapindaceae family originated from the Amazon Basin, especially the northern part of Brazil. Guaraná is also popularly called zoom, zoom cocoa and Brazilian cocoa. For centuries, the Amazonians relies on the fruit and seed used in various preparations of food and drinks, to dull pain and boost their mental and physical energy. The seed contains a chemical compound that helps to sustain the release of caffeine, thus prevent a caffeine crash. The seeds, which possess astringent quality, are roasted, finely grounded, kneaded on into a paste using water and even cassava before being shaped into small cylinders and dried. The prepared dried seeds are then used to make a fortifying drink to rejuvenate and energize the people before going out to hunt, which might last for days. Due to the astringency, the people also prevent or treat fever, heat exhaustion, diarrhea, dysentery and headache. The seed is also popularly used in banishing cellulite. Guaraná contains high level of caffeine. Individual with caffeine intolerance must avoid the herb. If under medication or taking supplement, please seek advice from personal doctor before trying the herb to avoid adverse reactions. Pregnant women and breastfeeding mothers should not take the herb or products containing the herb.